Vikings! 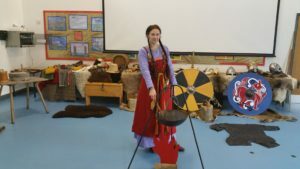 We visit the school in the personae of Ragnar Eriksson, raider at the time of the first Viking raids, and Helskegga Jomsdottir. Child ren meet us in Assembly for a few minutes [can be to the entire school], or straight into classroom for 9.30 a.m. start. They meet Ragnar fully armed and armoured with helmet, shield, sword, 2 handed axe, maille shirt, spear, seax, cloak and accessories. Very dramatic as he leaps into action, straight off the dragon boat! 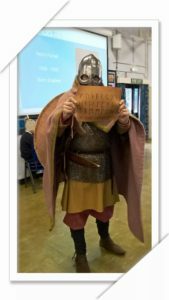 The children are each given a real Viking name for the day and learn how to write their new name using the Futhark [runes]. Then we discuss the known world with a period map, investigate local town & village names with Viking origins, trade goods with Viking lands, examine food and drink, do some object handling, compare & contrast lifestyles then and now, dressing up activities, military weapons & armour, have-a-go activities such as: making butter, battle tactics, grinding corn, fire-lighting with flint & steel, and strike [make] a real Viking coin [one per child if budget allows]. Finish the day with myths and legends including the Aesir, Asgard & Midgard, Bifrost, Valhalla and ending with Ragnarok. More rune writing of these terms. Plus much more, including Viking games Kubb and Hnafetafl.